Google Banned Chinese Tiktok Video Apps in India, Tiktok Video Apps Latest News 17 April, Apple IOS Tik Tok Application, Famous Actor in Tiktok Application, Chinese Video Apps Tiktok. Supreme Court Tiktok Latest News 2019: After receiving complaint filed in Madras High Court related to Tiktok Video Apps who is popular in Indian for its 5 to 15 second. Many people found Tiktok is playing Ashleel Samagri in its Application without proper security as well as not following age restriction related guidelines. So Google Play store remove tik tok link from its platform. Google has blocked Chinese Video App Tiktok from its Indian Platform. This decision came after Madras High Court rejected plea filed by one of Advocate lawyer belongs to Chinese Bite Dance Technology. So we advise you to don’t follow these types of Apps which published video without age restriction condition. 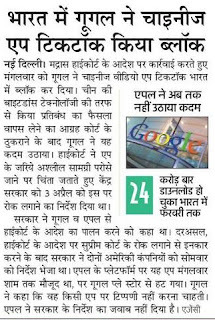 Tik Tok App on Google Play store: On 3rd April 2019 Court has already sent restriction letter to All Government State. 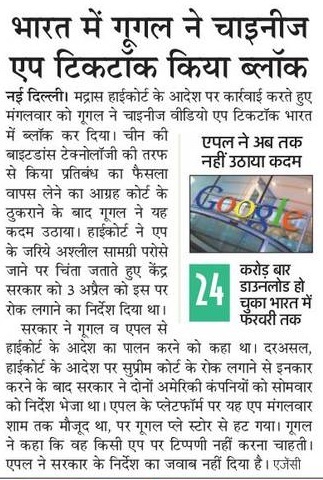 Then Central government Sais to Apple IOS Store, Bing (Microsoft Store) and Google search engine (Play Store) to remove Tiktok apps. Apple IOS Store Tiktok Apps: Latest news 17 April Apple has not yet replied about when it will banned Tik Tok app because Google Play store already blocked links related to Tik tok which can be downloaded. Google said on Tik Tok,” Google said we don’t want to comment on this. Popular Actor/Character to follow in Tik Tok Apps: we have top Musically, Tiktok Users.